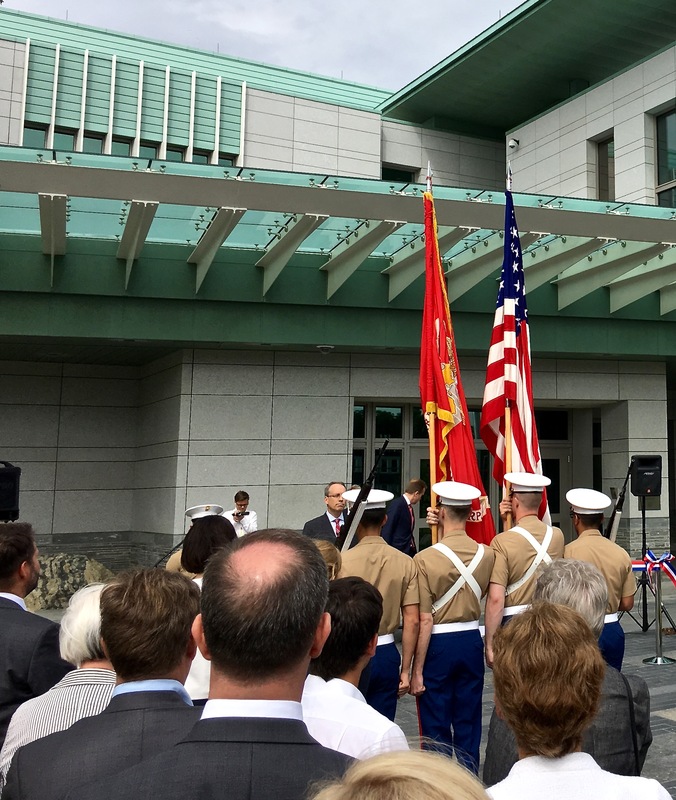 The Marine Color Guard paraded up to the new American Embassy Chancery, where Chargé d’affaires Jim DeHart awaited as Master of Ceremonies for the opening event. Click for a bigger view. 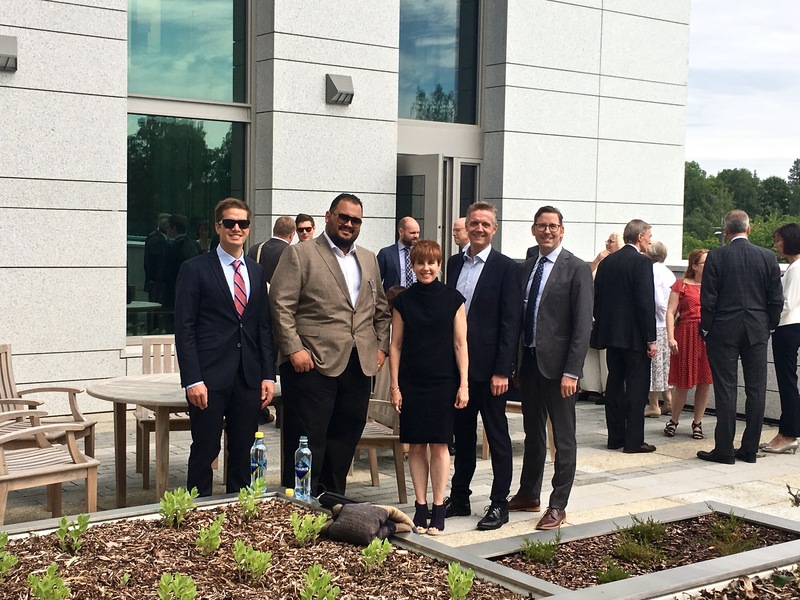 As expected, the Embassy opened with a big party — a ribbon-cutting ceremony held on June 15, 2017. It began with the usual fanfare: the Marine color-guard ushered in the American flag, followed by the singing of both countries’ anthems. All of the Norwegians gustily joined in for a resounding rendition of Ja, Vi Elsker Dette Landet (Yes, We Love This Land.) Embarrassingly, it seemed like only a handful of Americans knew the lyrics to The Star-Spangled Banner. Maybe we’re just shy about our singing voices. Or maybe no one wanted to attempt that really high note right at the end. Yeah, that must be it. 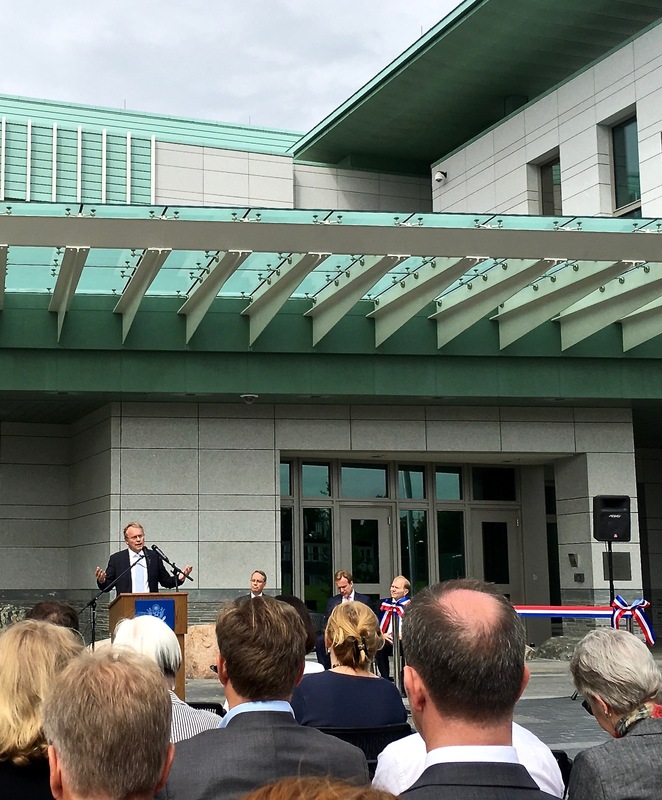 Governing Mayor of Oslo Raymond Johansen touched on the torrent of neighborhood protests over the new Embassy location and addressed how the city, U.S. State Department, and contractors had worked to accommodate their needs. But it was still clearly a sore spot in the community. Next, various government officials made their customary “nice job” speeches. American Chargé d’affaires Jim DeHart kicked things off by welcoming guests and thanking the designer (EYP Architecture & Engineering) and builder (our company, Walsh Global) for their efforts. Oslo’s Governing Mayor Raymond Johansen followed by offering rather guarded congratulations on the completion of a project that has clearly been quite controversial, the details of which he elaborated on at length in his comments. Yep, some seat squirming ensued during his recitation. Nobody really likes change, and the U.S. Embassy’s relocation to the suburbs has been a big one. The event saw no shortage of military men, both Norwegian and American. In October of 2017, Trump finally nominated a new ambassador to Norway — Kenneth J. Braithwaite, a 27-year veteran of the U.S. Navy and U.S. Navy Reserve. Yep, Norway’s a bit nervous about being caught between two saber-rattling nations — the U.S. and Russia. On-site signage notifies visitors of the many ways the building meets some of the strictest energy and sustainability codes in the world. Speechmaking concluded with U.S. Overseas Building Operations (OBO) Director Ambassador William Moser, who spent quite a bit of time emphasizing how the new embassy embodies green design and construction, having achieved LEED Gold certification for its numerous sustainable elements. The irony of his pride-filled comments when faced with the current administration’s persistent dismantling of environmental regulations was not lost on the attending crowd. Yet another awkward moment. 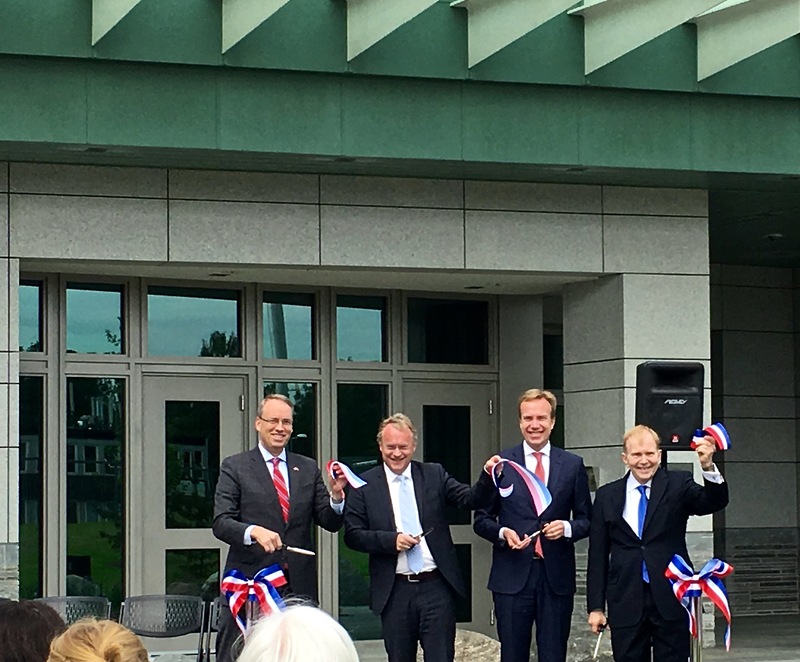 Pictured from left to right are Chargé d’affaires Jim DeHart, Governing Mayor of Oslo Raymond Johansen, Foreign Minister Børge Brende, and Overseas Building Operations (OBO) Director Ambassador William Moser. By the way, it’s not coincidental that the U.S. and Norway share red-white-n-blue flags. Norway modeled elements of its constitution and its national color scheme on those of America and France. The formal portion of the event wrapped up as the four speakers gathered together to officially inaugurate the Embassy by snipping the red-white-and-blue ribbon that draped its entrance. 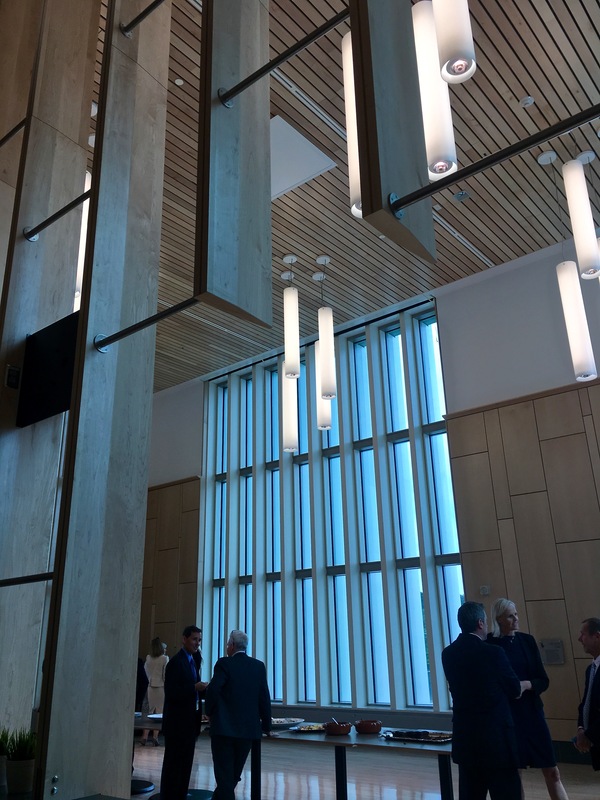 Pomp and circumstance over, Jim DeHart invited guests to explore the grounds, tour the buildings, and partake of the meal offered in the new Embassy commissary. Of course, everyone eagerly took him up on his offer — who doesn’t want free food, the chance to take a selfie with dignitaries, and an opportunity to snoop around a mysterious facility awash in conspiracy theories and besieged by neighborhood animosity, architectural criticisms, and bad press? Behind Matthew and me, guests begin their tour of the new American Embassy. Officers have removed their caps inside the new commissary and kitchen. Designed by famous Finnish architect Eero Saarinen (of St. Louis Arch fame), the old U.S. Embassy in Oslo sits right in the city center. Yep, it looks a bit gloomy, like a white-collar prison. 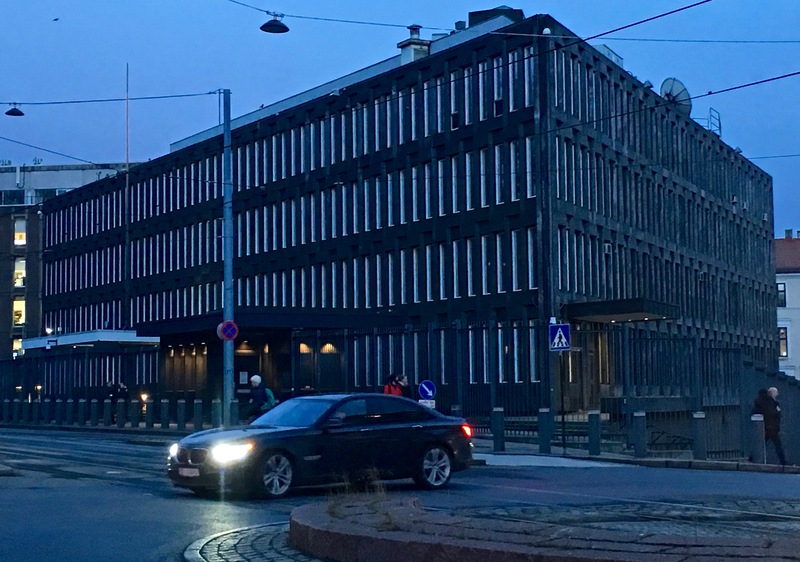 The new Embassy is situated along major public transportation lines about 20 minutes away, still making it within easy reach of Norwegian state offices but in a less congested area. So why is the new American Embassy such a hot topic? For starters, it’s located near a subdivision on the outskirts of Oslo. Local residents aren’t too keen on the idea of having a “terrorist target,” as it’s been called, right next door. I think you can imagine how nervous you might be in the same situation. Add to that the mess and noise of construction — no matter how hard we’ve tried to ameliorate these nuisances — and you’ve got yourself some unhappy neighbors. 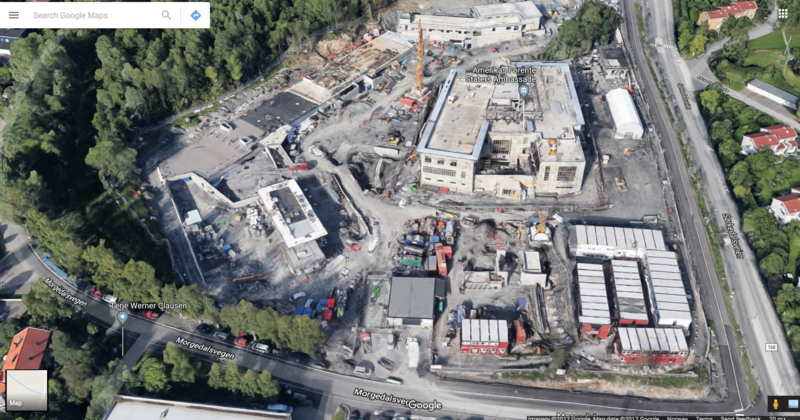 The current Google Earth satellite shot of the new U.S. Embassy hasn’t yet been updated and provides a flyover of the site while it was under construction. Nothing to hide here, folks. No walls, shrouded fences, or earth berms. Nothing has ever obscured what was being built. The cluster of structures on the bottom right of the photo and the white shed to the north were our construction trailers and temporary storage facilities, which have since been dismantled. Inaccurate reports of the facility’s size and layout have also spawned some pretty wild rumors, from tales of enormous subterranean spaces for CIA interrogations (which have earned it the nickname “Guantanamo 2.0.”) to giant surveillance facilities and databases for spying on nearby residents. It’s odd how anyone could believe such scuttlebutt, considering the site has been completely exposed both during construction and after opening, totally unscreened and out in the open for all to see — including Google Earth. But the ribbon-cutting ceremony and upcoming events where neighbors can tour the place will hopefully quash suspicions. The U.S. Embassy isn’t the only governmental installation in the neighborhood. The much larger King’s Guard Training Center sits just to the west. The King’s Guard facility also underwent some construction and improvements while the Embassy was being built. By the way, note the huge earth berm and chain-link-with-razor-wire fence that surrounds the King’s Guard facility, and compare it with upcoming photos of the open U.S. Embassy campus. Pictured is the Chancery entrance, surrounded by native birches, conifers, and wildflowers perched among granite boulders and a terrain that maintains the original contours of the land. To provide you with a few facts, the Embassy campus covers approximately 4 hectares (ten acres) and holds three small entry pavilions (consular, main, and service), plus a Chancery, Marine security guard residence, and an underground garage. Altogether, the buildings cover only about 7,500 square meters (roughly 9,000 square yards) of the overall wooded site. 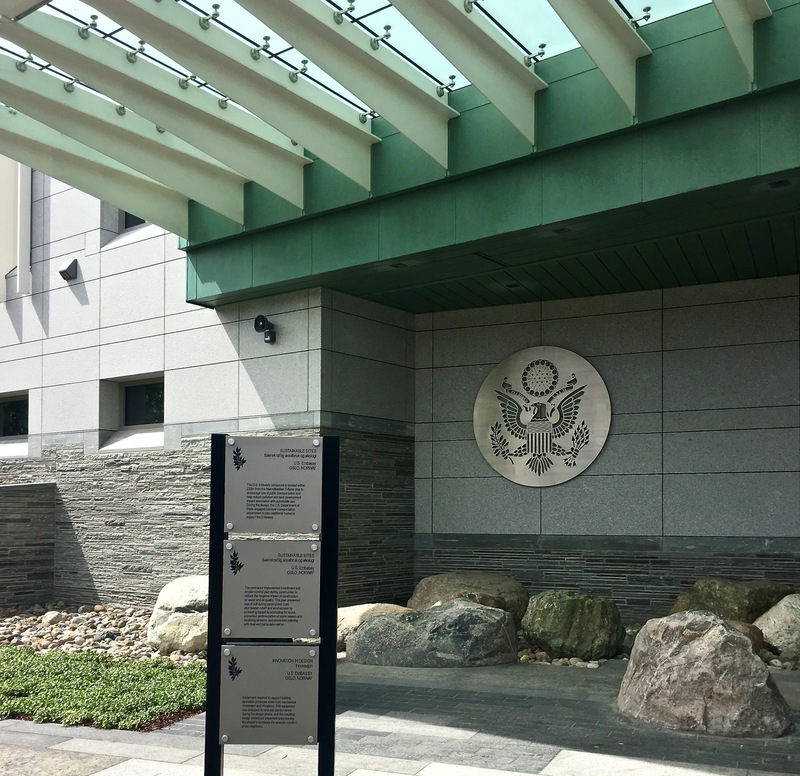 The chancery itself centralizes the offices of 200 U.S. government employees, which had previously been housed not only in the too-small old embassy but also in several other rented spaces scattered around Oslo. The surrounding park retains features of the natural topography and landscape, such as a seasonal stream, a dense stand of mature trees, a grassy meadow, and rock outcroppings, while at the same time providing space for improved security, as a well as additional community parking and skiing, biking, and walking paths around the site. To the right is the Chancery, the main building. Alongside runs the seasonal stream, a restored riparian environment original to the partially forested site. The reinvigorated streambed manages stormwater runoff to conserve water. An improved biking and walking path runs in front of the U.S. Embassy along Sørkedalsveien, which is situated within a five-minute walk to the T-bane (Metro train line). The Embassy has been criticized for the high perimeter fence that runs along the main roadway. (Hey, at least it’s not the chain-link razor-wire fence and earth berm that surrounds the King’s Guard facility.) The weird thing is that the fence here is nothing new; it’s identical to the one that surrounds the old embassy. But at least at the new embassy, the main entry pavilion is open and clear of fencing and you can approach the site unimpeded. At the old Embassy (nicknamed “The Fortress”), the entire site was encircled by the iron rails, studded with cameras, and watched over by a Norwegian mobile police trailer mounted on stilts across the street. Not nearly so inviting as the new Embassy campus. 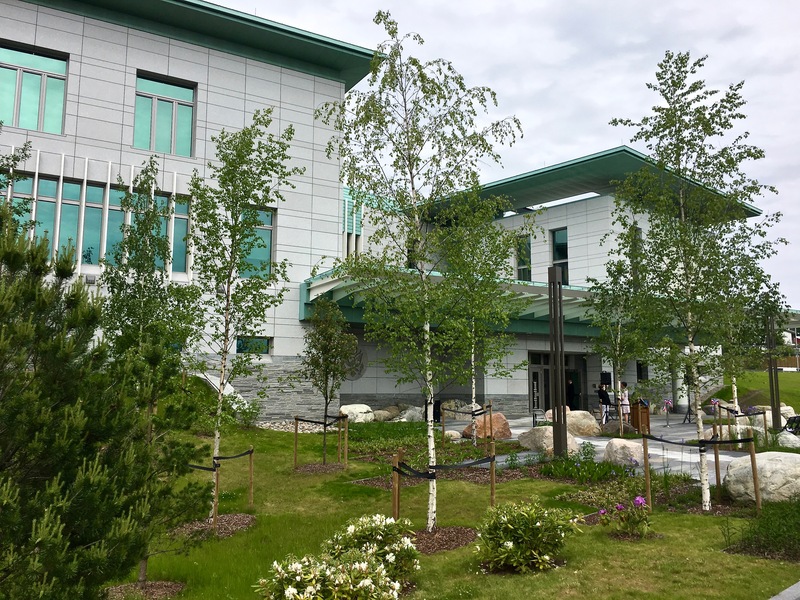 Pictured is the Chancery entrance, surrounded by native birches, aspens, maples, conifers, wildflowers, and grasses that have been scattered among granite boulders. I think it’s kind of funny to compare the Embassy’s open fencing with the high wooden fence that completely hides the subdivision across the street. Their board fence existed long before the Embassy was erected. Here, you can see the landscaped plaza in front of the Chancery. In the background is the service entry pavilion alongside an employee parking lot. Across the street is the Njårdhallen Sports Center, which has a public parking facility that has been enlarged and improved, along with new community sidewalks, as part of the Embassy project. Check out the Scandi design theme in the new Commissary. Norwegian homes typically have planked ceilings and huge windows to maximize the scant hours of daylight in winter. Architecturally speaking, the design has come under fire, which I find a bit surprising, as the architect aimed to reference both historic and modern Norwegian buildings, such as Akershus Fortress and Mortensrud Church. To me, the Embassy has that “Mid-century Modern” flair, a style originally driven by Scandinavian designers. Not to mention that its granite and copper cladding are common building materials all across Norway. And, as mentioned earlier, the entire campus is about as environmentally sensitive as you can get, with a green roof, huge windows to maximize natural daylight for energy savings, and a ground-source heat exchange system that will allow the Embassy to meet nearly 100 percent of its heating load. Oh well. I guess some people just can’t be pleased. The suspended roofline is made of copper — a nod to Norway’s contribution of the copper used to clad the Statue of Liberty. Norway was once the world’s largest producer of copper. Matthew and coworker Dan stand on the terrace outside the commissary. The fins on the windows help to reduce summer heat gain and minimize the glare bouncing off of the snow in winter. But having lots of natural light plays a key role both in energy savings and in combatting SAD (seasonal affective disorder), which is common in Scandinavia. Pictured are a few of the “last men standing” on the job site. From right to left, our fearless leader Matthew, our Norwegian local partner Tor, me, Reynaldo, and Dan. Yippee, we’re done! So how has the whole experience panned out for us? I’m not gonna lie, the project has been incredibly taxing for everyone involved — Americans and Norwegians, as well as the 47 other nationalities that have made up our team of more than 500 workers from multiple subcontractor companies. Standard 60-hr workweeks that usually evolved into 80 -90 hours, multiple project changes, and frequent roadblocks haven’t been easy. 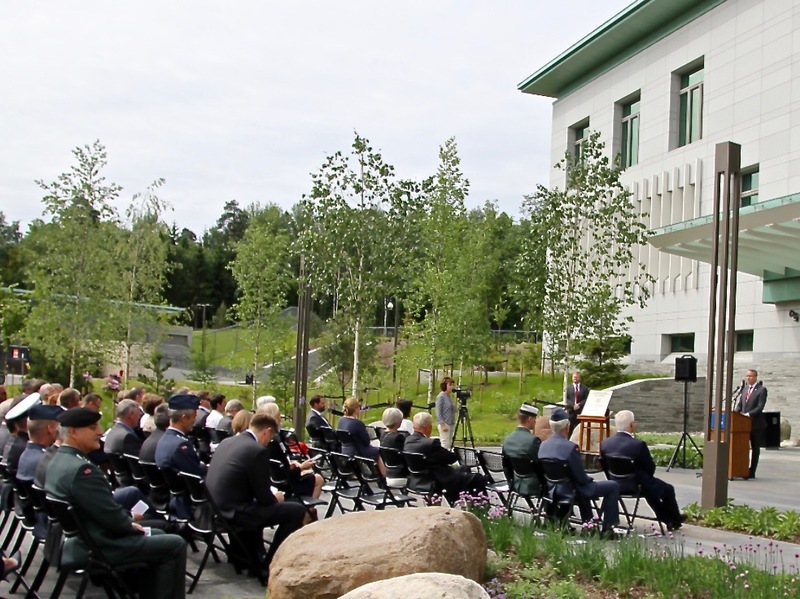 But in the end, our team can feel proud of the work they’ve done in helping to build a spiffy new U.S. diplomatic facility in Norway. So what’s next for us? Well, that’s a story for another day….